The United Kingdom's National Cyber Security Centre has backed Apple's and Amazon's denials of a Bloomberg Businessweek report that claimed Chinese spies planted tiny chips the size of a pencil tip on motherboards manufactured by Supermicro, which both Apple and Amazon used at one time in data center servers. "The NCSC engages confidentially with security researchers and urges anybody with credible intelligence about these reports to contact us," it added. But how do all these detailed denials and factual analyses override my moronic conspiracy theory that says everyone is lying except the source who told businessweek the truth? Clearly the first amendment is a sham and the US government is compelling Apple to lie instead of allowing them to merely keep their mouths shut. And certainly these chips have magic superpowers and can do things that lib tard chips can’t do. And certainly the only reason Apple is lying is because they are controlled by a China and don’t worry about the SEC fine when the truth comes out. Oh, wait. That’s two contradictory reasons. Well that just somehow proves my idiotic point. This is ridiculous. These "U.S. Officials" are just downright neanderthals if they think you can just replace any chip. They don't even understand how a motherboard works and the amount of work it would take to rework the traces on the motherboard to accommodate any modifications like this. You'd be crazy not to notice. This is a story that could only have been believed by a reporter ie: someone who is smart enough to think they understand how computers work, but not smart enough to understand how computers work. Let's put it this way: if you were going to put this magic chip onto a motherboard, what would it be connected to? And how would you hide it? Circuit board design isn't a random tangle of leads wandering around the board. They need to be where they are due to routing and physics. For network access, you need to connect that chip to something that is connected to a network. And power. And a clock. And if it does all of the stuff it says in the article it needs direct lines into the CPU, network card, and possibly the north/southbridge. That means a whole bunch of traces that magically appeared on a motherboard - and nobody noticed. Yeah, right. That's complete BS. Even a lights-out manager (LOM), which allows access when the power is out, requires a whole lot of connections. Noticeable connections. You can't really hide this kind of stuff. We run a server. Incredible amount of hack attempts logged. Mostly always from China. Probably the biggest cyber threat in the world. I'm still trying to figure how I can block any IP from China pre-emptively. Actually many chips on the board communicate using a standard bus system (I2C / SMBUS), so you could in theory attach anywhere on the bus to tap into it. There are reasons this story is implausible, but this isn't one of them. Good god the internet is full of people who think they are experts at things they've never done, I don't know why I bother reading comments. As someone who has actually designed circuit boards and had them built, there are multiple ways this could have been done. I've had PCB manufacturing partners tweak the gerber files output from my cad files, its standard operating procedure as they prepare the design for their manufacturing equipment and it sometimes needs tweaks to ensure it etches correctly or that pads are properly sized based on their assembly experience vs what the default sizes in the part library were. Regarding people spouting nonsense about it not having enough pins to intercept the CPU bus, no one freaking claimed it did. The supposid hack injected custom code into the remote management controller over its serial flashrom bus, which only requires 3 or 4 pins. Did it happen? I don't know. 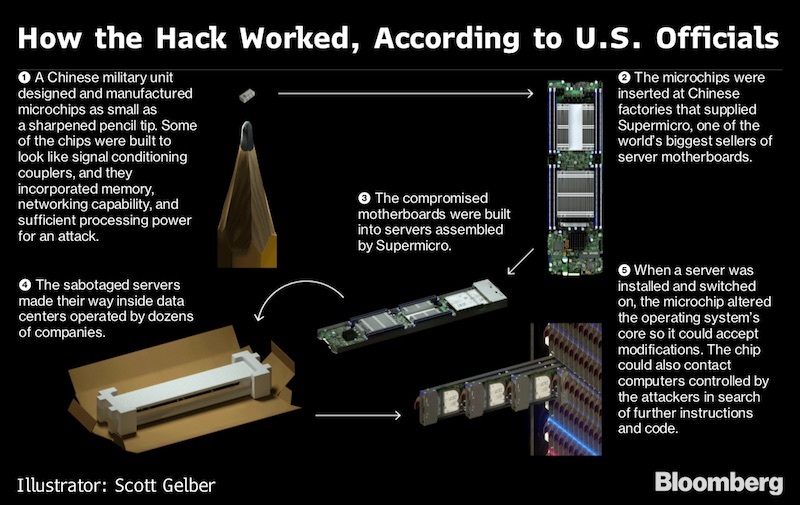 The most difficult part of this was secretly inserting the chip into the production line and getting someone to modify the gerber files, but, seeing the Chinese government has strong control over all their companies, I don't see that as a huge problem either. The gag order included having to actively deny it!!! The article is mostly right, but someone made it look like China is doing the spying when in reality it is someone else. Who do we know that has a history of installing spy chips on computers?